"There was Slugger O'Toole, who was drunk as a Rule." Check out our new album here! Slugger’s Rule own brand of Celtic and folk music began around the campfire. It started off getting together around a fire with songs, stories, and a healthy amount of booze. Over time, instruments were added and other influences surfaced, such as new songs from different countries and even a hint of bluegrass in their harmonies. However, their performances today stay rooted to the original fire pit where they would drink, entertain, sing, and discuss the history and meaning of the music that they love. Today, they sing a collection of Irish, Scottish, Canadian, American, British (only a few!) folk songs and sea shanties. They claim influence from classic groups such as the Clancy Brothers and The Dubliners, but also from more modern groups such as The Pogues, Gaelic Storm, and Great Big Sea. Their music is a story, and the performance is a conversation with the audience. Brian "Donkey" Morgan was first taught to sing old folk songs at an early age by his grandmother, Dorothy Andersen. A lifelong music teacher, she also introduced him to his first guitar at the age of five, which he still has. He discovered a passion for singing the old songs with his friends shortly before leaving for college. "We would go out into the woods, dig a little pit for a small fire, and pass a jug around while we sang." He smiles while he recounts, "We were all collecting songs and sharing them with each other then. We would dig through old university library basements, as far away as the east coast. We would learn from any singers we might meet traveling across America, and from any any recordings we could get our hands on. We soon had so many that the sun would rise on our "evenings" together and still we would be singing." As his friends drifted apart and started raising families, Brian began to share this type of activity with others who hadn't encountered it before. "This is an activity that mankind has always taken part in, something pivotal to most cultures throughout history, but that mainstream America has largely set aside for one-sided forms of entertainment. It's missing... but it's important." Brian was born in the rural midwest, but his family moved down to the growing Dallas metroplex area just after his formative years. His youth was spent split between the city and the farm. "I don't really belong where I'm from anymore, but I don't consider where I'm at "home," he shrugs. He identifies with songs of loss, especially immigration songs such as Spancil Hill. "I like a bittersweet note somewhere in an evening. It's a reminder of places now inaccessible, times past, and beloved people long lost. The deepest losses in our lives are best remembered in the abstract, and I can't think of a better time than during an evening of singing and playing merry ditties." "Our band... Matt, Josh, and Kelvin and our patient, supportive wives are as much my family as anyone is. It's a cooperative effort that we all love. The whole is so much greater than the sum of the parts. We don't sing for people, we sing with them. When we play and sing, we are going somewhere, leaving our cares behind, and we hope everybody else in the room will come along!" At the 2015 North Texas Irish Festival, Brian just celebrated twenty years of attendance (and the first performance there by Slugger's Rule,) by upgrading to a lifetime membership with the SCMA. He's looking forward to becoming more involved in the near future. Matthew Cook (or Matt, if you like) received his first guitar his Sophomore year of High school. Now, he had been playing music for years at this point, starting with choir, grabbing a year of piano in there, and quickly moving to trombone. However, after strumming it a few times he did what teenagers tend to do, and the poor guitar sat around for some years, collecting dust. He finally decided to pick it up again in college, once he realized is great love for traditional Irish Music & Sea Shanties, born from the time he spent with his future brother-in-law, Brian. He learned 4 chords, G D C and Em, to start out with, and just played and played until he had those down. That took some time, poor chap was fairly slow, but eventually he got to be pretty good at it. He then took an interest in the Bodhrán, and took classes at the amazing O’Flaherty Irish Music Retreat and learned a great deal about it. Armed with that knowledge, he now plays his drum whenever and wherever he can, trying his best to not be one of those Bodhrán players. Matt had also always wanted to learn the Mandolin, so after many years of talking about it, he just, out of the blue, bought one. From there he has started to learn chords and melodies alike in an effort to bring yet another dynamic to the band. Armed with his arsenal of instruments, Matt strives to play and sing to the best of his ability and bring life to the wonderful music that he and his band-mates play and love. Josh has always had an interest in Celtic mythology and history. Growing up, he would read about the Scottish kings, Arthurian legends, and Irish fairy tales. It was no surprise that he was naturally drawn to various rock songs that also featured bagpipes. From there, he found his way to other traditional Irish and Scottish music along with sea shanties. He then stumbled upon some of the great folk music like the Clancy Brothers and The Dubliners. The music struck a chord with him (no pun intended) and he was hooked. Later in life, it must have been fate to convince him to purchase a little bamboo flute with six fingerings. He learned to play it and found that he had a knack to pick up songs on it. He had heard the tin whistle before and counted that it also had six fingerings so it had to be! He also picked up a Bodhrán drum soon after that and began to beat on it. Later, he decided that perhaps he should join the ranks of the stringed instruments and picked up the banjo. He loves playing with his band-mates to introduce the music that he loves to those who haven't heard it and bring a smile to those who've been listening to it forever. He's happiest seeing people learn a new song, smile to hear their favorite, and to have a roaring good time in a night. Kelvin started learning music in first grade. He asked for piano lessons for Christmas from his parents. They agreed and that’s when it all began. After his family moved to Fort Worth, he didn’t enjoy playing piano as much. In fifth grade he was intrigued to join his orchestra and learn the violin. He continued to play the violin in his school orchestra throughout middle school and high school. He also played with the Fort Worth Youth Orchestra for a few years. In the summer before his freshman year in high school, he learned how to play the snare drum. He auditioned for, and was accepted into the school drum line at the beginning of the semester. Around this time, he also started teaching himself bass guitar so that he could play with his church praise band. Upon entering college, he began to focus on things other than music. Upon dating Lauren Hoffman and being introduced to her friends, he found out that Matt, Brian, and Josh had formed a Traditional Irish Band. He asked if he could join them and they agreed. 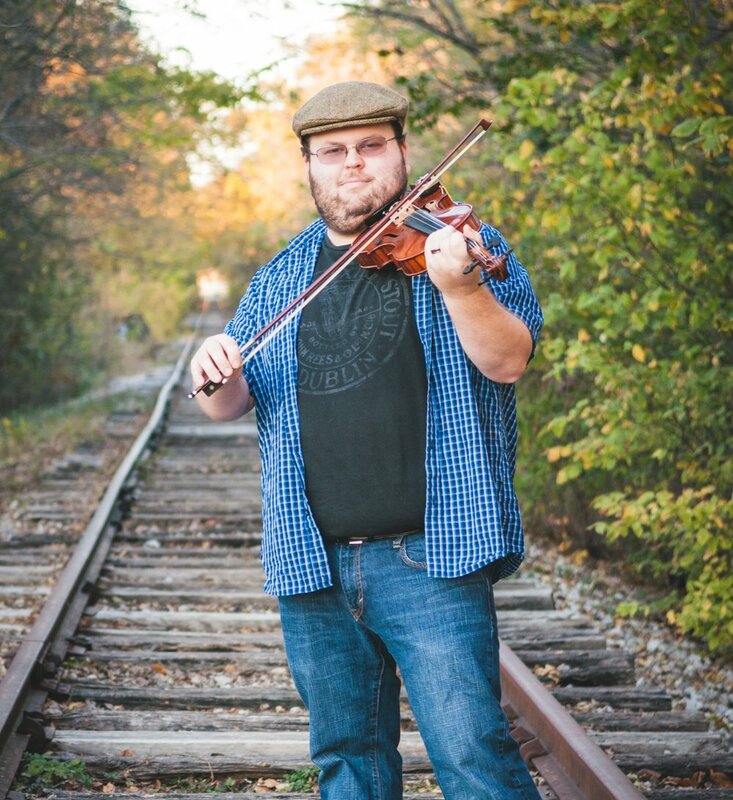 Transitioning from Classical violin to Irish fiddle was a challenge, but at the same time it was very fun. Sharing his love of music, be it Classical or Irish or any other type, has always been a large part of his life and he has no plans on stopping anytime soon.